For an animated film with an environmental message, we go to 2016’s Norm of the North. 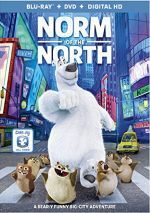 Polar bear Norm (voiced by Rob Schneider) lacks a killer instinct but he boasts a strange gift: he can speak to humans. Norm’s peculiar talents come to the fore when humans start to invade the Arctic. Unnerved by the new home construction on the animals’ territory, Norm works to sabotage these endeavors. He heads to NYC where he thinks he can use his skills to maintain the Arctic’s pristine nature. Do animated movies need to be from major studios like Pixar, Disney or DreamWorks to be good? Perhaps not, but those locations come with certain inherent advantages, largely due to money. Animation doesn’t come cheap, so bigger budgets mean superior cartoons – in a technical sense, at least. When I look at the problems I find in Norm, the animation seems like a minor concern. Does the CG look good? Not really – the art tends to seem plastic and without the depth and detail we’d get from the bigger studios. Still, the animation doesn’t create a prominent problem. Norm comes with firmly middle of the road art, as the material fails to deliver strong visuals but it doesn’t flop, either. Norm loses most of its points elsewhere, mainly due to its relentless mediocrity. At no time does this become a terrible movie, but it never threatens to become anything better than bland and forgettable. Much of this stems from its complete lack of originality. Take characters and situations from a slew of better-known animated films, toss them in a blender, and out comes Norm. Nary a creative moment emerges in this highly derivative piece. It doesn’t help that the story barely makes any sense. Once again, the uncreative nature of Norm turns into an issue, as the movie tends to compile a mix of plot beats from other flicks without a lot of logic or coherence. The film simply regurgitates a mix of story points that it barely links in a logical manner. Along with a slew of forgettable voice performances, all these factors make Norm a completely ordinary experience. Could it have been worse? Sure – even with all its drawbacks, Norm seems reasonably professional. That’s faint praise, though, as the end product feels trite and recycled, without any identity of its own. Norm of the North appears in an aspect ratio of approximately 1.78:1 on this Blu-ray Disc. The image looked solid. Given the Arctic orientation, blue became the movie’s dominant hue. However, other shots – especially in NYC – managed a broader palette, and the movie showed these colors in a vivid manner. Blacks seemed dark and deep, while shadows appeared smooth and clear. Everything about the transfer pleased. Though not bad, the movie’s DTS-HD MA 5.1 soundtrack seemed less impressive. This was because the soundfield often lacked much ambition, though it did improve as the movie progressed. Early scenes failed to use the five channels especially well, as they focused on the front channels even during action-oriented scenes. However, matters opened up better in the film’s second half. Sequences such as one during a storm at sea used the channels in an engaging manner and created a good soundscape. I just wish the mix boasted that much activity from the start. Audio quality seemed good. Speech was distinctive and natural, without edginess or other issues. Music was perky and full, while effects appeared accurate and packed a nice punch. The semi-restrained soundfield left this as a “B” mix. A handful of extras appear here, and we start with Do the Arctic Shake!, a sing-along. It goes for one-minute, 25-second and lets viewers croon with the movie’s dance song. It’s a forgettable addition. Nine Deleted Scenes fill a total of four minutes, 35 seconds. Most of these come from the Arctic parts of the movie and they offer minor character moments. The others focus on Mr. Greene’s machinations, and they also lack much substance. Don’t expect anything interesting from this lackluster set of sequences. Next comes That’s Funny!, a compilation of “the movie’s best jokes and one-liners”. The reel goes for two minutes, six seconds and gives us a slew of attempts at humor. These fail to deliver much amusement. Called The Arctic Challenge, a trivia game ensues. It includes 14 true/false questions about Arctic life. It boasts minor educational value. 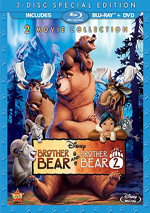 The disc opens with ads for Shaun the Sheep: The Movie, Beyond Beyond, Alpha and Omega: Family Vacation and Alpha and Omega: The Legend of the Saw Tooth Cave. No trailer for Norm appears here. A second disc presents a DVD copy of Norm. It includes the same extras as the Blu-ray. Persistently ordinary, Norm of the North gives us a mediocre animated adventure. While not without a smidgen of entertainment value, the film seems too disjointed and derivative to succeed. The Blu-ray offers excellent visuals and mostly positive audio but lacks substantial supplements. Little kids may derive some enjoyment from this lackluster cartoon but others can find more satisfying material.